Security policies are naturally dynamic. Reflecting this, there has been a growing interest in studying information-flow properties which change during program execution, including concepts such as declassification, revocation, and role-change. A static verification of a dynamic information flow policy, from a semantic perspective, should only need to concern itself with two things: 1) the dependencies between data in a program, and 2) whether those dependencies are consistent with the intended flow policies as they change over time. In this paper we provide a formal ground for this intuition. We present a straightforward extension to the principal flow-sensitive type system introduced by Hunt and Sands (POPL ’06, ESOP ’11) to infer both end-to-end dependencies and dependencies at intermediate points in a program. This allows typings to be applied to verification of both static and dynamic policies. Our extension preserves the principal type system’s distinguishing feature, that type inference is independent of the policy to be enforced: a single, generic dependency analysis (typing) can be used to verify many different dynamic policies of a given program, thus achieving a clean separation between (1) and (2). We also make contributions to the foundations of dynamic information flow. 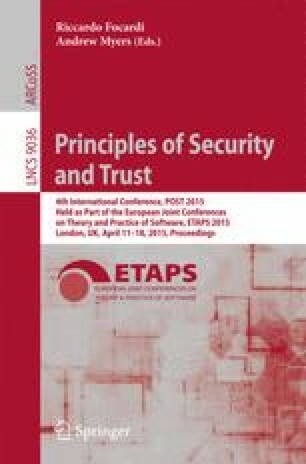 Arguably, the most compelling semantic definitions for dynamic security conditions in the literature are phrased in the so-called knowledge-based style. We contribute a new definition of knowledge-based progress insensitive security for dynamic policies. We show that the new definition avoids anomalies of previous definitions and enjoys a simple and useful characterisation as a two-run style property.